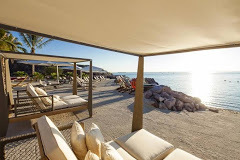 La Paz, a sleepy fishing town with a population of 180,000, is a town that transforms itself into a world class diving and fishing destination when the water in the Sea of Cortez warms up. 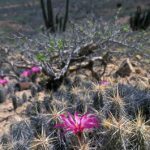 A short, picturesque 2 hour drive from Cabo San Lucas or an even shorter flight from Phoenix or Los Angeles, La Paz is great for anything from long weekends to longer stays. 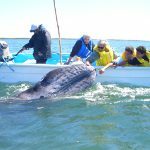 Swimming, scuba diving, surfing, snorkeling, sea kayaking, sport and deep sea fishing, wind surfing, whale watching, island camping, jet skis, and many other water sports can be enjoyed in La Paz. Dive Los Islotes’ sea lion rookery, the El Bajo Sea Mount, and the wreck of the car ferry “Salvatierra”. Dive with the hammerhead sharks, sea lions, whale sharks, dolphins, manta rays, and gamefish of the Sea of Cortez. La Paz is a great town for handicraft and artwork purchases without the touristy feel of Cabo San Lucas. Some of the best scuba diving and fishing is yours to experience just hours from Los Angeles. 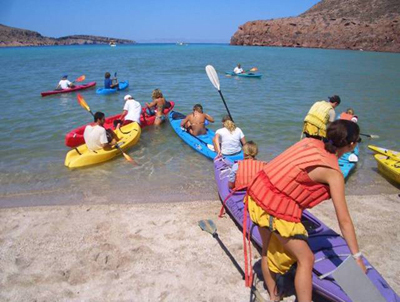 The island of Espiritu Santo offers the perfect getaway from civilization…kayak, sail, or camp on and around the island. An abundant selection of restaurants will satisfy most preferences and price ranges. Located at Club Cantamar, Baja Diving & Service has grown from a small, one boat operation to a fleet of the largest, fastest and most comfortable boats on the Pacific Coast of Mexico. Their 25 year success is based on good, affordable, friendly service. Boats depart daily at 8:30am. Enjoy breakfast at the dockside restaurant as your boat is being prepared. After a full day of excitement, you’ll return to the dock at 5:00pm. Because many dive sites are located some distance from La Paz, the Fun Baja fleet has been designed for speed. Getting you as much bottom time as possible is a priority, and faster boats allow for two and three tank dives. FUNBAJA is a 26 ft diving boat that holds 8 passengers and has a cruising capacity of 35 knots. MARIFER, CAROLINA and CAROLINA II hold 10-12 divers each and cruise at 25 knots. MARIFER II is a 35 foot cabin cruiser that accommodates 15 passengers and has a cruising capacity of 28 knots. 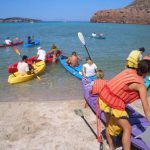 In addition to day trips, Fun Baja also offers multi-day scuba camping trips on the island of Espiritu Santo, as well as snorkeling & kayaking tours. 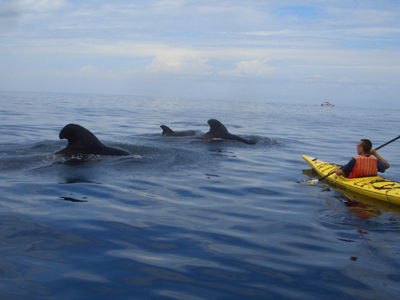 Paddle and kick with whales and sea lions! Ever wanted to try NITROX or technical diving? A full range of PADI and SSI courses and certifications is also offered. Diving in La Paz is considered mid-level to advanced due to strong currents, the depth and shape of the dive sites, the presence of thermoclines and the impressive range of fauna. 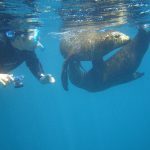 Having said that, the shallow waters around the Sea of Cortez islands are perfect for beginners and provide the opportunity to swim with sea lions, watch mantas, look for whale sharks and observe many colorful fish. Expect a visibility of 50-80 feet and an underwater environment that is virtually free of commercial fishing and absolutely full of stunning marine life. Below are the top dive sites. Many would say this is the best dive site in the Sea of Cortez! Because the strong currents make for difficult swimming, most divers hold onto rocks and wait for schools of hammerheads, whale sharks, manta rays and marlins to pass by. This dive site, located north of Holy Spirit Island, is an hour and a half boat ride from La Paz. 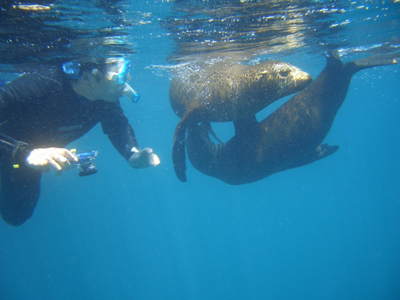 The 200-300 friendly sea lions make the trip worthwhile for both divers and snorkelers. These soft coral covered cracks on the sea floor near the Sea Lion Colony attract eels, small manta rays and even some big fish. This 250 ft ferry boat sank in 1976 and now lies in the San Lorenzo Channel at the southern end of Holy Spirit Island. Reef fish and snapper are commonly observed. Enjoy a mild current as you explore caves, crevices, rocky reefs and a coral forest. See the Cortez angelfish, and other fish endemic to the Sea of Cortez. This dive site, another hour and a half boat ride from La Paz, features wreck and wall diving. Enjoy the sight of a wide variety of fish as sea lions frolic along the shore. A 3-4 hour boat ride from shore, this site is well suited for live-aboard trips. Schools of tuna, big marlin and mackerel are found here. 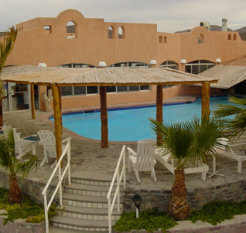 Club Cantamar, a family owned and operated dive resort, is spacious and comfortable with stucco walls and mexican tile floors. 35 Standard Rooms feature air-conditioning, ocean views and satellite TV. Two spacious Jr Suites also feature kitchenettes and living/dining areas and each can accommodate up to 4 people. Four 2 bedroom/2 bath condos with full kitchenettes, living rooms, dining rooms and private balconies are located just steps from the beach. Mexican-style seafood at it’s best. Fish tacos, ceviche, and chiles rellenos stuffed with lobster salad are served, along with larger plates of seafood or traditional Mexican dishes. Juicy steaks, a large variety of delicious burgers and an impressive wine list are the specialties. Everything is grilled with mesquite firewood on a rustic grill visible from the patio dining area. Closed on Tuesdays. Located at the Hotel Mediterrane, La Patza serves trendy Italian-Swiss fusion cuisine. Try one of the fresh, homemade pastas featuring local seafood or the lasagna baked in a wood-fired oven. A glass of wine from the extensive wine list will complement your meal. Closed on Tuesdays. Vegetarians and those who feel like a light, healthy meal will appreciate the menu at this cheerful café. Potato tacos, fresh-fruit smoothies and a variety of tortas are offered. Enjoy a delicious breakfast before your full day of diving or relax at the swim-up bar in the afternoon while you recount tales of your diving adventures. Three buffet-style meals offered daily. Located in Hotel Los Arcos, Bermejo offers one of the more elegant dining options in La Paz. The restaurant specializes in steaks and seafood, but also offers some excellent breakfast and lunch dishes. Pelicanos Bar, located above Bermejo, is a fun lounge-style establishment featuring live piano music and a great view of the waterfront. Take a hiking tour of prehistoric cave paintings in the beautiful desert surrounding La Paz. Desert Bighorn and the great roadrunner are common sightings in this area. 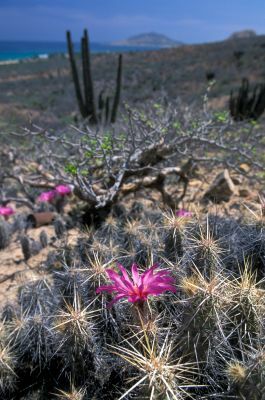 Hike the Sierra de la Laguna, a mountainous mass that was declared a biosphere reserve in 1994. Observe the dramatic change in vegetation as elevation increases. 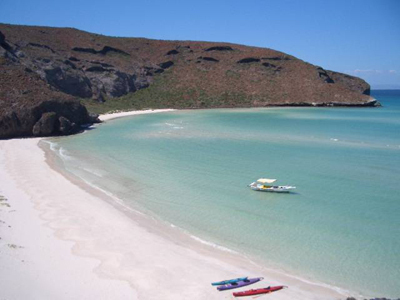 La Paz is the capital city of the Mexican state of Baja California Sur which lies in northwest Mexico. It is one of the main cities of the southeastern Baja California Peninsula region and is located north of Los Cabos and south of Tijuana. How long are the flights to La Paz? Alaska Airlines offers nonstop flights from LAX to La Paz with a short flight duration of 2 hrs, 20 min. From New York, flying time is 7 hrs, 30 min or 10 hrs, 30 min with a stopover. They use the Mexican peso. For almost all purchases, the US$ is accepted with change in pesos. Bringing smaller denominations of the US$ is suggested, as sometimes it is difficult to break a $100 bill. Spanish is the official language. English is spoken in the main tourist areas. U.S. citizens are advised to have a valid passport. Upon entry into Mexico you will be given a blue tourist card which will serve as your tourist visa. These are usually good for 90-180 days. They use 120 volts just like the US. However, some newer hotels/resorts are now using the more common 3 hole plug. If you need a converter or adaptor, it is advised that you carry your own. What airlines fly to La Paz? It depends on the hotel/resort that you choose to stay at. However, when it comes to your diving transfers, the dive centers usually provide roundtrip hotel/dive center transfers. Please check with the dive shop that will be handling your tours. 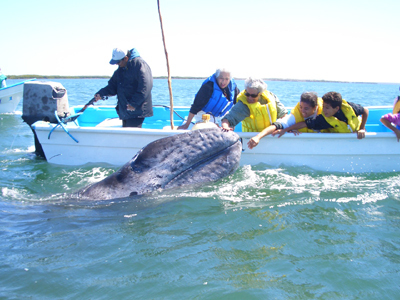 Diving in La Paz takes place in the Sea of Cortez, dubbed “The World’s Aquarium” by Captain Jacques Cousteau. It is a must for all diving enthusiasts. 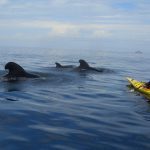 Possible encounters include playful sea lions, schooling hammerhead sharks, whale sharks, blue, gray and orca whales, dolphins and giant Pacific Manta Rays, to name a few. Wreck dives, schooling amber jacks and tuna, and dive-through caves, one of which you can surface inside of, will keep you happily entertained. Departures begin at 8:30am. You will be back at the resort by 5:00pm. We recommend wearing a 3mm wetsuit. While the water can get warm enough to go without, we recommend wearing one for protection.